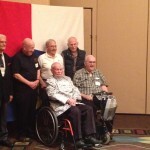 The Survivors of Wake, families and friends, met this past weekend (September 20-21, 2013) in Boise Idaho for the annual reunion and we were honored to have six of the civilian survivors with us. Posing for the group photograph this year are Mick Johnson and J. O. Young seated, and Leroy Myers, Rich Pagoaga, Joe Goicoechea, and Glenn Newell standing. We know of twenty-three civilian survivors still living, though distance and health issues make it difficult for many to attend the reunions. Of the 1,145 American civilian contractors on Wake Island, 250 died before the end of the war including those who died in the siege and battle for Wake in December 1941, the 98 who were massacred on Wake in 1943, and the men who perished in Japanese POW camps. After Japan surrendered in August 1945, American B-29s dropped tons of food and supplies into the POW camps (one unfortunate Wake POW was killed by a falling pallet). Military officials entered the camps over the coming weeks to process the prisoners, get them to medical help, and send them home. Through the fall of 1945 a steady stream of ships and planes brought liberated Americans to the West Coast. Many returned to loving families; others found relationships had ended in their absence. Some slipped seamlessly back into society; others were damaged beyond repair. An unknown number of the Wake survivors died within a few years of the war, unable to recover or unlucky in life. 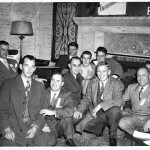 Hundreds of the survivors gathered in early December 1945 at the Boise Hotel for what would be the first of many annual meetings. My father, Ted Olson, is shown with half a dozen fellow survivors including Alice’s husband, Pete Ingham, in the 1945 photograph below. The men voted to organize as the “Workers of Wake” in order to lobby for wartime compensation and disability coverage. During the war a group of wives and family members had organized the “Women of Wake” under the leadership of Mary Ward, who had fought for the passage of public laws to cover wage payments and dependent allotments. Ward was elected president of the new group to pursue lawsuits and additional legislation relating to internment of the contractors from Wake, Guam, and Cavite, but membership waned as issues divided the group in the coming years. In 1959 the group reformed and incorporated as “Survivors of Wake, Guam, and Cavite” and with renewed strength and focus pressed for VA recognition, medical benefits, and disability coverage (achieved in 1981). Membership expanded, newsletters reached mailboxes across the nation, and hundreds of survivors and their wives attended reunions held in different cities each year. They attended to business in the general meetings, met in small groups with their ex-POW buddies, and later partied and danced with the ladies late into the night. Their dancing days are over now, but the few who can come to the reunions still share a special bond with each other and welcome us with their warm handshakes and hugs. The six men who attended the banquet in Boise this weekend included four local men and two from out of state. Just out of high school, Boise’s Joe Goicoechea and Rich Pagoaga, along with two of their pals, were among the youngest of the workers who signed up for a good-paying job in the Pacific. The four came to Wake together, arriving in early August 1941. Joe recalls that the Morrison-Knudsen-led operation on Wake encouraged young unskilled laborers to learn a trade while there, and he was determined to become a steelworker, which he did with the Wake head start, working for M-K in Afghanistan after the war. From the ranch country northwest of Boise, Glenn Newell and his brother also came to Wake as young laborers, arriving in late September 1941. 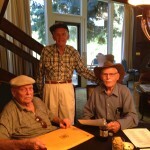 The Newells were among the “Boise Boys” invited to visit Harry and Ann Morrison at the guest house on Wake during their weather-extended visit in October 1941, and Glenn remembers Mrs. Morrison’s kindness to this day. Carpenter J. O. Young arrived on Wake that October and was glad to have the company of his older uncle, a heavy equipment operator, on Wake. J. O.’s recollections of liberation from Naoetsu POW camp in 1945 were recorded in a postwar Idaho Press-Tribune article and used recently (unbeknownst to J. O.) in the best-seller, Unbroken, by Laura Hillenbrand. Mick Johnson, who comes to the reunions from Kearny, Arizona, was a truck driver and mechanic out of Washington State in 1941. During the siege of Wake, Mick stepped forward to help repair the handful of Wildcat fighters defending the atoll from daily attack, until the last plane was destroyed. With his fellow mechanics and the grounded pilots, Mick took a stand at a 3-inch gun on the south beach during the invasion on December 23, 1941. Most of his fellow defenders were killed; Mick was badly wounded but survived and was awarded the Bronze Star after the war. Charles “Leroy” Myers also makes the long annual trek to Boise from his home in Modesto, California. Leroy followed his father, a heavy equipment operator, to Wake in 1941and worked with him as an oiler. Leroy and his dad remained side by side through the war, helping each other survive the deadly Camp 18. Last May, Leroy made a return trip to Sasebo, Japan, and the camp where so many of his fellow prisoners died, and he walked the length of the dam they built. At the reunion, Leroy shared a long poem he wrote about a dream he’d had years ago that helped him overcome his bitterness to the Japanese. In the dream a huge book rises from the sea. Written in bold letters are the words: Hate Destroys the World. Leroy remembered as a starving prisoner how a Japanese lady, at great risk to herself, dropped two sweet potatoes for him and his father, and how others helped them survive hell and gave them hope. “It has helped a lot, these many years, to smile and forgive, then hide all my tears.” Leroy and the other Wake survivors who have lived long lives and can still share a warm handshake and smile had ample reason to be filled with hatred after the war, but they learned the lesson that hate is destructive. We would all do well to take that lesson to heart.